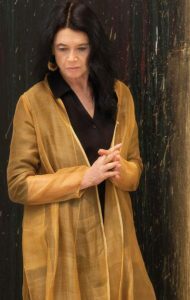 Anne Waldman is a prolific poet and performer, creating radical hybrid forms for the long poem, both serial and narrative, as with Marriage: A Sentence, Structure of the World Compared to a Bubble, Manatee/Humanity, and Gossamurmur (Penguin Poets). She is the author of the magnum opus, The Iovis Trilogy: Colors in the Mechanism of Concealment, a feminist cultural intervention taking on war and patriarchy, which won the PEN Center 2012 Award for Poetry. She has been deemed a “counter-cultural giant” by Publisher’s Weekly for her ethos as a poetic investigator and cultural activist and has been at the forefront for decades in creating poetic communities. She was a founder of the Poetry Project at St. Mark’s Church In-the-Bowery and The Jack Kerouac School of Disembodied Poetics at Naropa University with Allen Ginsberg and Diane di Prima. She continues to work at Naropa as a Distinguished Professor of Poetics and Artistic Director of its Summer Writing Program. She is the editor of The Beat Book and co-editor of Civil Disobediences: Poetics and Politics in Action, Beats At Naropa, and Cross Worlds: Transcultural Poetics. Her latest book is Voice’s Daughter of a Heart Yet To Be Born (Coffee House Press, 2016). She is a Chancellor of the Academy of American Poets. Celebrated as a remarkable performer with a unique vocal range including techniques of Sprechstimme and her own model structures, she performs on stages all over the world. Sponsored by the Dillon Johnston Writers Reading Series, the reading will take place on Tuesday, September 27 at 6:30 p.m. in the Charlotte and Philip Hanes Art Gallery.